Boilex Pyramid stove and fuel. Boilex All in One stove. Q: Thank you for talking to us. Fuel and stoves are important for the main reason of feeding troops on the go in many different climates and terrains. Can you talk about how Zip/Boilex got involved with Military? As a serving infantry Officer in the British Army I was only too aware of the cooking challenges faced by soldiers in the field and the impact a new, clean burning, safe fuel could have to defense forces globally, especially on morale. Q: Could you explain the benefits of Zip over standard military fuels which are in the market place? A: The key benefits to the military of Zip Military Cooking Fuel (ZMCF), which is made from a sustainable, natural biofuel, is that it is not classified as hazardous and is non-explosive, so safe to air transport and parachute drop; this immediately overcomes the huge logistics difficulties associated with most other fuels. It is also clean burning, smokeless (so can be used in any combat arena without giving away visible location) and safe if accidentally consumed by humans or wildlife. The fuel is also small and lightweight in size, so easy to carry. Easy lighting is ensured by the ignition wrapper, which also results in the product being waterproof. It also has no sell-by date – in fact, just like a fine wine, performance improves with age! The fuel was initially designed as a direct replacement for products made from Hexamine/ Trioxane, which is smelly, highly toxic to burn (Hexamine releases hydrogen cyanide compounds that means it may only be used with adequate ventilation) and can seriously harm and even kill if accidentally consumed. Hexamine is also known for the significant amounts of soot and combustion deposits it leaves on mess tins/mugs – this does not happen with ZMCF. In addition, traditional Hexamine tablets burn for only c7minutes and does not boil 500ml of water. In comparison, each cube of ZMCF burns for 18-20 minutes and will achieve boil in c9 mins. There are still cleaner burning alternatives, such as gas and alcohol. However, both are highly explosive and present serious transport difficulties and additional costs. In comparison, ZMCF can be transported without restriction. Since both the fuel itself and the packaging of ZMCF are burned, there will also be no waste for the soldiers to carry – so no more empty gas canisters or heavy ancillary equipment! Q: With lightening the load a major problem to all Modernisation programmes, can you talk through the different options you have available within the Zip/Boilex range and how they can be utilised by individuals and groups? A: We are of course aware of the need to lighten the weight a soldier has to carry. It’s essential. 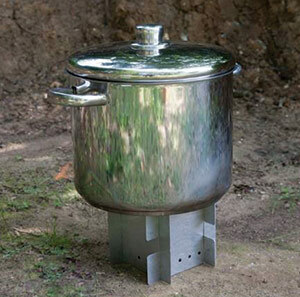 We know one military where the cookstove for each soldier weighs close to 5kg! From the very beginning, it was our intention to produce a lightweight product. Each cube of ZMCF weighs only 26g (at point of manufacture), with 8 in a standard issue box. We also have a larger format for the fuel that is used for group cooking, where each block weighs c100g, with 6 in a box. 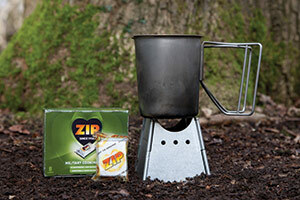 The performance of ZMCF is optimised when used with any of the award winning range of lightweight Boilex™ Cookstoves. The Boilex stoves are flat packed and thereby designed to be easy to pack into personal webbing and equipment. There are four core stoves in the range, two for individual cooking, and two for group cooking. a. 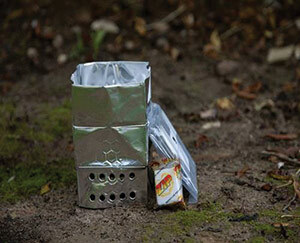 The Pyramid stove is a flat packed stove that simply folds out and hooks together in under 5 seconds. So extremely easy to use. Made from aluminium (50g) or aluminum foil (17g), it is ideal for personal cooking with small pots/pans/mess tins/mugs and will boil 500ml of water in under 9 minutes with one cube of ZMCF. b. The All in One stove is again flat packed, weighing only 55g, and was designed specifically for survival and arctic situations where hot water was needed urgently. It is both a stove and receptacle all in one! It will boil 500ml of water in c8 mins with one cube of ZMCF. As for group cooking, we again have two stoves. d. is our larger group-cooking smokeless Ultraclean Forced Air stove, which is capable of using different types of fuel, including high energy density fuels, such as ZMCF (which boils 5 litres of water in c16mins), as well as biomass, such as wood, dung, twigs, pellets, and even liquids, such as kerosene/ alcohol and diesel. By actively controlling the air flowing through the stove, total clean burn is obtained from simmer through to full power. It will also charge electronic devices through an inbuilt USB/DC port. Q: Could you if possible talk to us about which countries and regiments are using the fuel at the moment and any other key points that you feel our readers should know? A: Since the cookstoves are only now being launched to market, use is currently limited, but is mainly centred on European and Asian use. For many Militaries, we are currently in confidential trials so I unfortunately cannot name them! We also sell a limited number of products through various retail outlets in north America, Europe and Japan. We have a significantly sized manufacturing facility, from which we already supply a range of ignition products to 6 continents, so scalable production capability is already in place, not just for military but also for humanitarian use to address the need for smokefree cooking; over 3bn people cook daily in a smoky environment, resulting in over 4m deaths per year and tens of millions suffering from other diseases, such as cancer, pneumonia and cataracts, the leading cause of blindness in the developing world. We feel extremely proud to be in a position to now make s serious impact on such a dreadful situation with the launch of our safe, smoke-free cooking range for both military and humanitarian needs across the globe.